Effective, residue-free management of African Bollworm. Advanced virus technology for suppression of African Bollworm larvae, manufactured to the highest standard by world renowned virus specialists, Andermatt Biocontrol. Ingestion of even one virus particle ensures mortality. There is no sub-lethal dose. This makes Bolldex® a highly effective population and resistance management tool and ideal for IPM programs. Many opportunities exist for the target pest to ingest virus particles, starting when the eggs hatch. This improves population reduction and damage control to the crop. Bolldex® can be applied at low volume application rates. This allows for effective pest management right up to harvest and gives you residue options for other management needs. As the Bolldex® virus is highly specific it will not harm beneficial insect populations. Bolldex® can be applied without risk to bee populations and secondary pest outbreaks. Bolldex® is user friendly and easily incorporated into chemical programs as long as pH of the spray tank is managed. Non-toxic, no MRL, completely natural, safe for applicators. 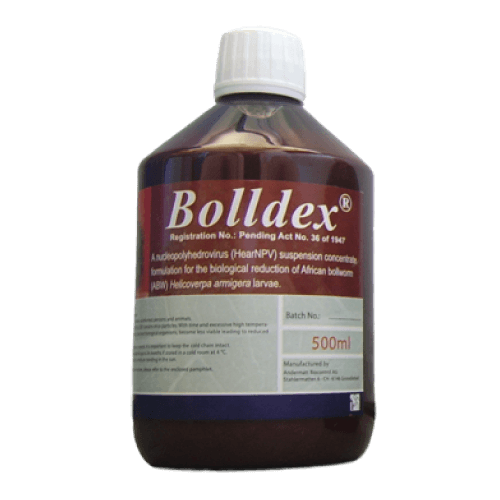 Bolldex® virus particles must be ingested to be effective. Ingestion chances by the African Bollworm are high, due to virus particle concentrations dispersed per application. 1 – 2 virus particles are enough to cause mortality. When virus particles are ingested, they travel into the midgut of the larvae. The high pH environment causes the dissolution of the protective capsule surrounding the virus and releasing it. These virus particles infect the cells lining the midgut and replicate. These new virus particles are released into the haemolymph and go on to infect other cells, where replication continues. The widespread infection of the larval cells cause the insect to stop feeding and death occurs. The production of enzymes, such as chitinase, cause lique cation, releasing viruses that can serve as a secondary source of inoculum to infect other larvae. Bolldex® application of 100 ml and 200 ml on sunflowers, gave up to 71 % suppression of Bollworm infestation which makes it an ideal tool for the reduction of bollworm larvae in an integrated program. Figures left: Percentage suppression of control of Bollworm larvae on sunflower compared to an untreated control. 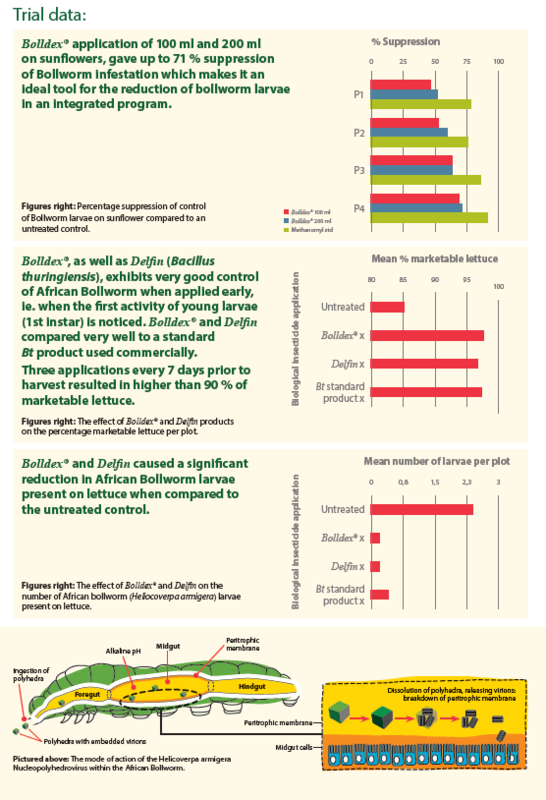 Bolldex®, as well as Delfin (Bacillus thuringiensis), exhibits very good control of African Bollworm when applied early, ie. when the first activity of young larvae (1st instar) is noticed. Bolldex® and Delfin compared very well to a standard Bt product used commercially. Three applications every 7 days prior to harvest resulted in higher than 90 % of marketable lettuce. Figures left: The effect of Bolldex® and Delfin products on the percentage marketable lettuce per plot. Bolldex® and Delfin caused a significant reduction in African Bollworm larvae present on lettuce when compared to the untreated control. Figures left: The effect of Bolldex® and Delfin on the number of African bollworm (Heliocoverpa armigera) larvae present on lettuce.